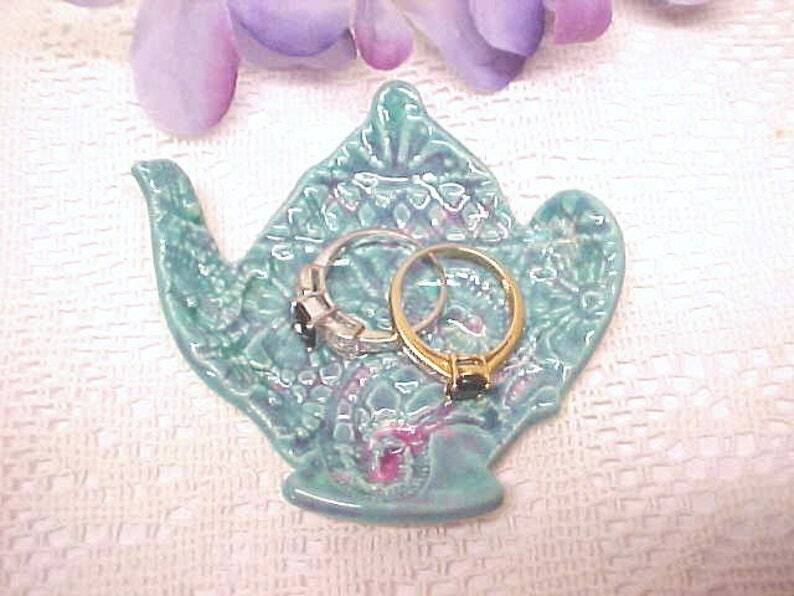 This is your choice of colors in a Teapot Shaped Ring Dish, Spoon Rest, Trinket decorative tray. It makes a lovely tea bag holder, too! I hand crafted this lovely dish from porcelain, impressed a gorgeous piece of lace while damp & glazed in many glaze colors before firing, including Turquoise, Pink, Emerald Green & Purple. 🎀 MEASURES about 3 1/4 inches wide tip to handle, about 3 inches top to bottom. Bottom is unglazed, has my stamp & little cork pads. Nicely thin, not heavy. Please set the drop-down on your choice of colors, either the Pink background or the Turquoise.